The Bolivar Petit Coronas is a Cuban best seller, a strong creamy and rich Mareva, 5.1” (129mm) long, of 42 ring gauge, and comes in a 25 cigars box. The Bolivar Petit Coronas is one of Bolivar's most popular vitolas, along with the Belicosos Finos and the Royal Corona. This is a cigar that makes itself known right from the start. A Pre 1960 release. The Bolivar Petit Coronas is a best seller among all the Petit Coronas. 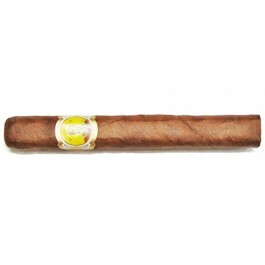 The Bolivar Petit Corona is a very well constructed, very firm and well packed. An attractive golden brown smooth wrapper with little veins. Semi-box pressed with a nice cap. Like most Bolivars, there is a strong scent of wood, as well as cocoa with muskiness on the wrapper. All very well balanced with spice, wood, cocoa and fruits, delivers full and robust creamy flavors. If smoked slowly, the cigar smokes well until the end without becoming hot or overwhelming. A lot of aging potential. Smoke this vitola slowly.